The Waterloo-Wellington Branch of the OGS, which served Waterloo and Wellington counties, was formed by Eldon Weber and Jacqueline Norris in 1972. In 1991 the Branch began a review with the objective of enhancing its ability to serve the regional territory covered by the Branch by electing two vice chairs – one for Waterloo and one for Wellington. As a result, meetings were held in Guelph at the Orange Lodge on Waterloo Avenue on a regular basis and several of the committees, such as the Cemetery Recording, Church Records and Branch Library, started dividing the work. By 1997 when the Waterloo-Wellington Branch was celebrating its 25th Anniversary, it was decided to divide into two separate branches. By 2000 all the assets had been divided and Wellington applied to OGS to become a separate Branch. This was granted in September 2000. 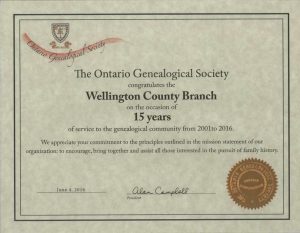 The Wellington County Branch of the OGS was officially granted its Charter on January 1, 2001. The Charter was officially presented to the Branch in a ceremony held 24 April 2001. Pictured below is Ken Bird, 2001 OGS President, presenting the Charter to Elinor Knight, Region III Director, and Jack Knight, the Chair of the newly formed Wellington County Branch. Fifteen years later, the Wellington County Branch is still thriving. 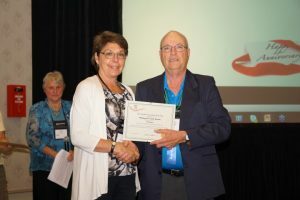 The photo below taken at the 2015 Ontario Genealogical Society Conference shows Alan Campbell, the Past President of the OGS, presenting our Branch Chair, Jan Salsberg, with a certificate honouring the Branch for 15 Years of Service. A special thank you goes out to the following men and women who have served over the years on the Wellington County Branch of the Ontario Genealogical Society Council. Thanks to their hard work we have many valuable genealogical materials at our disposal today.